The Hedgehog Concept was first introduced in the book Good to Great, by Jim Collins. In this article, we’ll explain the concept and show how you can apply it to your organization. Given the choice between being a fox or a hedgehog which one would you choose? Most people and companies would probably choose to be a fox. This is because foxes are considered to be organized, neat, sleek, and cunning. Hedgehogs, on the other hand, are none of those things. They are small, slow, prickly, and not that clever. It might surprise you to learn that according to Collins, it’s better to be the hedgehog and not the fox. Later, in 1953 Isaiah Berlin wrote an essay based on the parable called, The Fox and the Hedgehog. In the essay, Berlin examined the difference between people who are fascinated by the infinite variety of things and those who relate everything to a singular view of the world. Collins brought the fox and the hedgehog to the business world. According to Collins, companies and their leaders can be either foxes or hedgehogs. Foxes are a very clever creature and can pursue many goals at once. They see the world in all its complexity. They have a variety of ways to achieve any goal. Hedgehogs, on the other hand, are a much more simple creature. They are not capable of seeing complexity. They don’t have multiple approaches to solve a problem. They have just one big thing they can do well. They can curl themselves into a ball to protect themselves. In business speak, we could say that hedgehogs simplify the world into a simple goal and then execute to achieve that goal. In Good to Great Collins’ states that great companies behave the same way. They stick to doing what they’re best at and avoid getting distracted. With the almost infinite opportunity of the marketplace, it’s incredibly easy to get distracted. Even great companies need to fight to stop themselves getting distracted. Companies rarely fail because of the lack of opportunity. They fail because there’s too much opportunity. They get distracted from what they’re best at and spread themselves too thinly. So, how does an organization become more like the hedgehog and less like the fox? It can find its inner hedgehog at the intersection of these three questions. Firstly, it needs to understand what its employees are truly passionate about. Secondly, it needs to figure out what it can do better than anyone else. Thirdly, it needs to find a good mechanism for generating profit. 1. What do you feel most passionate about? Passion is important because passion is a huge motivator. If you don’t have a passion for something then how can you possibly be great at it? Great companies don’t tell their employees what to be passionate about. They find what their employees are already passionate about and then look for projects aligned with those passions. It’s important to realize that we’re not talking about finding elements of passion in what you do. Everyone can probably do that. This is about doing work that you are completely passionate about. 2. What can you be best in the world at? This is about more than developing a great core competency. It’s about deciding on one key area your business can do better than any other business. It’s then about focusing on this area exclusively so nobody else can match you. Firstly, this is about focusing on what you can be the best at, not what you want to be the best at. Secondly, if you cannot be the best in the world at your core business, then your core business cannot be your Hedgehog Concept. You’ll need to search for something else. You might find that what you are capable of doing better than anyone else in the world is not even something you’re currently doing. 3. What drives your economic engine? What one factor creates money for the organization. It’s important that every company is able to generate a constant flow of revenue, and more importantly, profit. You can think of the economic engine of a company as being like the blood that flows through our bodies. It doesn’t define who we are or what’s important to us, but without it, we die. We can’t achieve any of the things we want to achieve in life. It’s the same in business. Without an economic engine, then it doesn’t matter how noble a businesses objectives are, it will go bankrupt and realize none of them. If a company is working at the intersection of all three questions then it has found its inner hedgehog. Of passion. Of being the best. In an area where money can be created. It’s going to be likely that the company will be successful. Good to Great companies set their goals based on their Hedgehog Concept. This is very different from setting your goals from the desire to grow, for example. To use the model you need to investigate each of the three areas and how they apply to you and your organization. What is it about your job that gets you passionate? Are there things you get really excited about doing? Do these same passions exist within the other people of your organization? If not, what are the things your people are most passionate about? Can these passions be woven into the fabric of your organization through changes to the vision, mission, strategy, and values of the organization? 2. What are you best at? What is the one thing that your organization can be better at than anyone else? It’s not enough to think of things you can be joint-best at, or things you’re good at and have done for years. 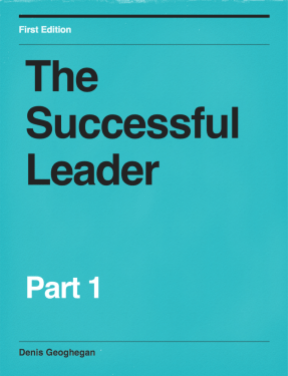 You need to find something that you can be better at than every organization in the world. This can be a great time to develop your Stop Doing list. This is another concept from Good to Great. It is a list of things you’ll stop doing to enable you to better focus on your Hedgehog Concept. Tools such a SWOT Analysis and the Core Competencies Model can be useful inputs to helping you find what you can be best at. Here you need to find the key financial metric you will track for your business. This metric will help you to know that your producing strong cash flows and a healthy profit. In a Software as a Service (SaaS) business, it could be Customer Lifetime Value. In the airline industry, it could be revenue per tonne per mile. Once you’ve generated your ideas for each of the three areas, you need to look for the sweet spot where all three overlap. 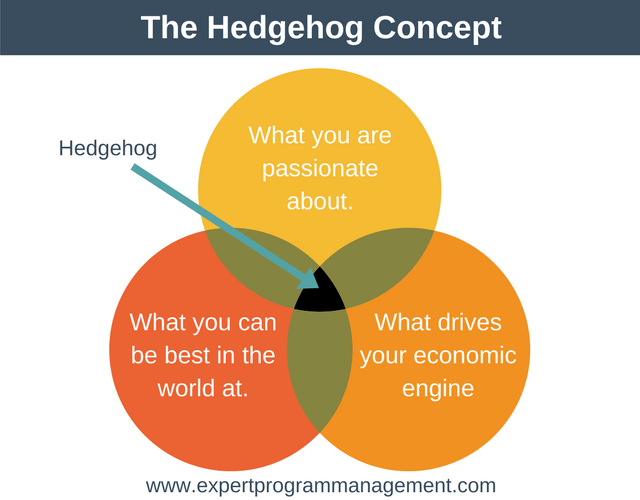 Where all three areas overlap is your Hedgehog Concept. This should become the core area of your business that you focus on to drive your organization forward and separate it from the competition. The four steps given above make it look easy to find your Hedgehog Concept. It isn’t. It takes time to develop your Hedgehog Concept. It’s not going to happen overnight, in a flash of brilliant inspiration. In Good to Great, Collins’ highlights that it can take around four years for a business to find its Hedgehog Concept. To help develop their hedgehog concept many companies use a Business Council. A business council is a group of people from different areas of the business who meet regularly. They are tasked with finding the Hedgehog Concept. Once the Hedgehog Concept is found they are tasked with ensuring it is being driven forward. To be effective the council needs the right people on board. This includes a very senior executive plus people from all levels of the organization. The Hedgehog Concept can be summed up in a single word: focus. What you feel most passionate about? What can you be the best at?